The Akasha Chronicles, Book 1, Emily's House by Natalie Wright is an epic coming-of-age novel that throws fourteen-year-old Emily into the Sacred Grove, a world she never knew existed. She initially wants no part of it, but she exits from it as a very different woman. Along the way, she must discover her inner strengths and learn that not all she sees around her might be as it appears. Reminiscent of the trials of Hercules, she must overcome many challenges to prepare for her ultimate conflict with Dughall, the antagonist, as he conquers fairies, magic, and dragons to penetrate the Sacred Grove's defenses in his quest for the Golden Torc, the key to the Netherworld. Will Emily be up to the challenge? 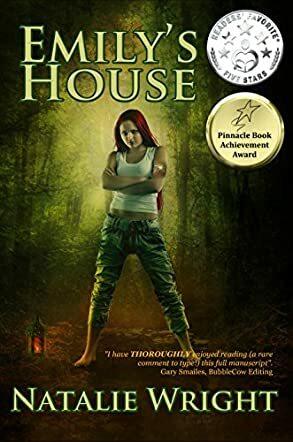 Start out with a teen, add a pinch of angst, stir in equal parts fantasy and science fiction, add challenges and adventure to taste, let it brew, then turn up the heat and you have the recipe for The Akasha Chronicles, Emily's House. Wright’s novel is suitable for preteens and older who enjoy good escapism, as the plot, characters, dialog, and descriptions all have something for almost every age. It is an easy read with a smattering of more challenging words to increase a young reader’s vocabulary. From the first chapter on, Wright grabs your attention and leads you willingly to follow the young protagonist’s trials with plenty of action, cliffhangers, and wonderful imagery. I found it very entertaining and look forward to the other books in the trilogy.